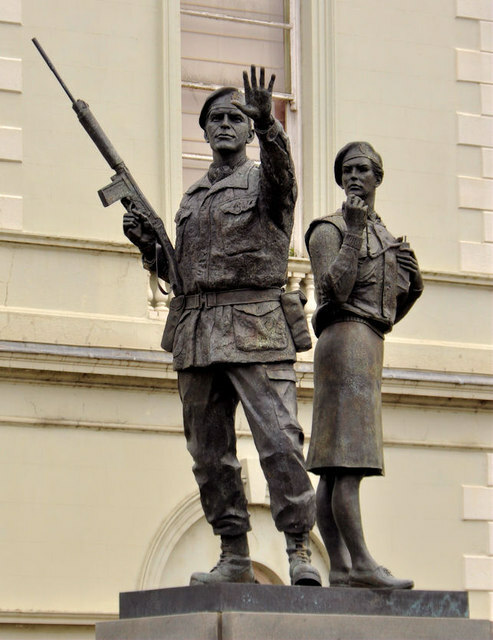 UDR – Ballydugan Four – Lest We Forget! On 9 April 1990 the Provisional IRA (PIRA) detonated a massive IED roadside bomb under an Ulster Defence Regiment (UDR) mobile patrol which killed four members of the UDR. It was the worst attack against the UDR since seven years previously when, in July 1983, four soldiers of the same regiment were killed in a similar attack near Ballygawley. It was also one of the worst attacks against the security forces in County Down since the Warrenpoint Ambush of August 1979 when 18 British soldiers were killed and six injured. Pte John Birch (28), LCpl John Bradley (25), LCpl Michael Adams (23) and Pte Steven Smart (23), all members of the Ulster Defence Regiment were killed in an attack on their patrol on the morning of 9 April 1990. Killed in land mine attack on Ulster Defence Regiment mobile patrol, Ballydugan Road, Downpatrick, County Down. The men were killed in a Provisional IRA land mine attack on their mobile patrol on the Ballydugan Road, Downpatrick. They were travelling as part of a two Land Rover patrol from Ballykinlar to Downpatrick when the PIRA used a command wire to detonate a 1000lb landmine bomb hidden in a culvert beneath the road which exploded under the men’s Land Rover killing them instantly. Four UDR soldiers in the lead Land rover were treated for injuries along with two civilians passing by. It is always a privilege to speak in this House on any issue, but on this occasion I speak about something I have wanted to raise for some time: the case of the four Ulster Defence Regiment men who were murdered at Ballydugan, outside Downpatrick. Four men jump into a vehicle and head to the next part of their job. They have worked together for some time, and the craic is great as they journey through the beautiful countryside on an idyllic morning. Just as any of us might do on any given day, they leave behind wives, children and loved ones to do their job and earn their pay. There the similarity ends, however, as the atrocity unfolds. This is an important issue, and I am sure that Members in the House will heed its significance. I declare an interest as a former member of the Ulster Defence Regiment. I served in it for three years, as did some of my colleagues on this side of the House. Other hon. and gallant Members in this House have served in other regiments, and I am pleased that they have made an effort to come to the Chamber as well. On the morning of 9 April 1990, Private John Birch, Lance Corporal John Bradley, Private Michael Adams and Private Steven Smart, all members of the Ulster Defence Regiment, were murdered by the Provisional IRA in an attack on their mobile patrol on Ballydugan Road, Downpatrick. The four young soldiers, all in their 20s, were travelling as part of a two Land Rover patrol en route from Ballykinlar to Downpatrick when a 1,000 lb bomb placed in a culvert beneath the road—I repeat, a 1,000 lb bomb; imagine the magnitude of that—was detonated by command wire. The explosion was so powerful that it lifted the soldiers’ Land Rover 30 ft into the air and hurled it 30 yards into a field, killing them instantly and leaving a crater 50 ft long, 40 ft wide and 15 ft deep. Those are the facts of what happened on that fateful morning. These are the faces of those whose lives were destroyed and whose family’s lives were torn apart, never to be the same. The men in the service of Queen and country, much like the officer on duty in this place last month, were simply doing their job and nothing else; there were no links to anything other than their desire to wear a uniform and their bravery in serving the community in Northern Ireland, which we salute. I remember three of these men very well. Lance Corporal John Bradley, 25, of Cregagh, Belfast, was married with a two-year-old son and a three-month-old daughter. He had recently been promoted, having served four years with the Ulster Defence Regiment. He had served with the Royal Highland Fusiliers, and came from Port Glasgow in Renfrewshire. Private John Birch, 28, was married with a four-year-old son. He had joined the regiment in February the previous year, and came from Ballywalter, where I was raised. The fact of the matter is that I can remember when John Birch was born. His wife was expecting again. Private Steven Smart, 23, was from Newtownards, the main town of ​my Strangford constituency. He had served for 18 months in the regiment. His mother is dead, but his father is still living.